Attention, check your spam folder in E-mail after registration and ordering. The circuit uses dual feedback system for better linearity. The main emphasis in the scheme - is an addition to improve reliability for PA.
PA input is protected by resistor attenuator. Also, АТТ is optimizing input for input VSWR. Elements are protected circuit for РА if input power is too high. Trimmer you can adjust protection drop value. Protection scheme is with the "sticky" status, i.e. transistor key state is holding until you will connect ESC contact with the ground or OFF/ON the main +13,8V voltage for the protection board. The temperature control is separated for BIAS and for FANs from two thermistors. BIAS voltage are adjusted for each MOSFET separately and stabilized by, in this case, can by in range +12-15V. LED-IN, LED-FAN, ТХ indicators are on PA front panel. 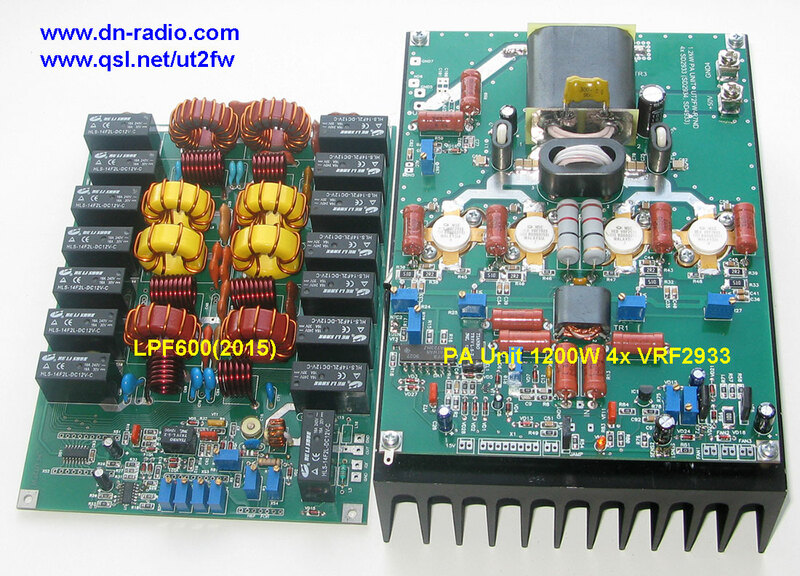 The amplifier module 4x VRF2933 runs of +50V and with 1200W. With +52-54V - the power increased up to 10-15%. With 45-48V – the power decreased up to 5-10%. 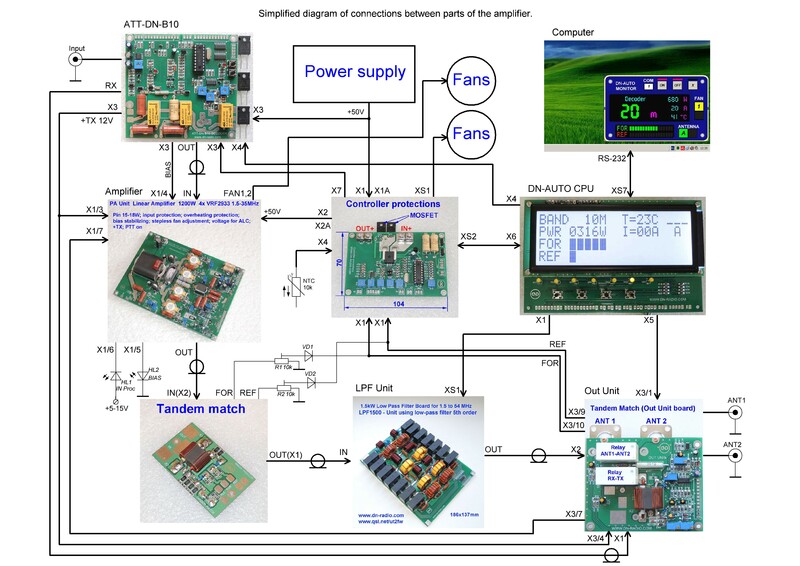 For board control, does not necessary external voltage +TX. To control output switching, just short the ground pin and pedal pin. PA Unit schematic in a qualitative form will be included on CD. The power measurement was measured with following set (the set video is located above). 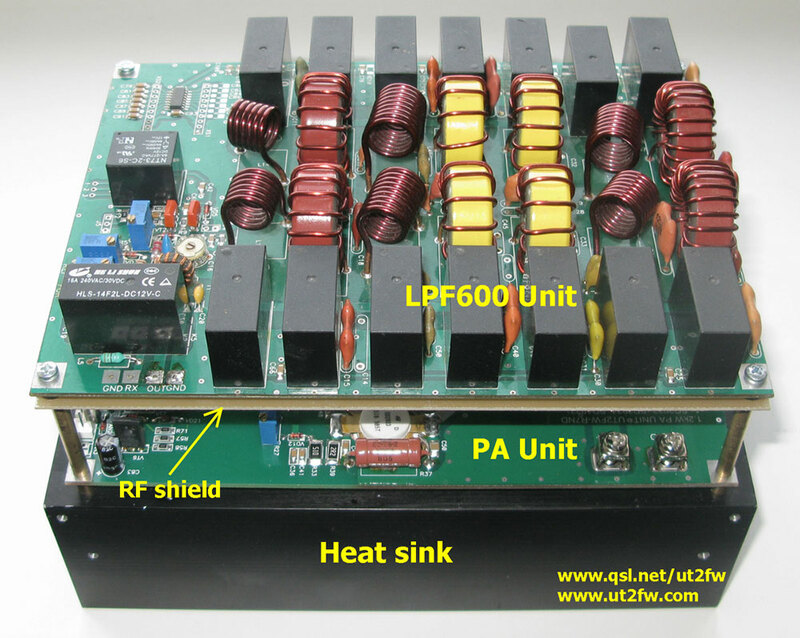 Heat sink + Copper plate + PA Unit + LPF600. Power unit + 50V RSP-1500-48. 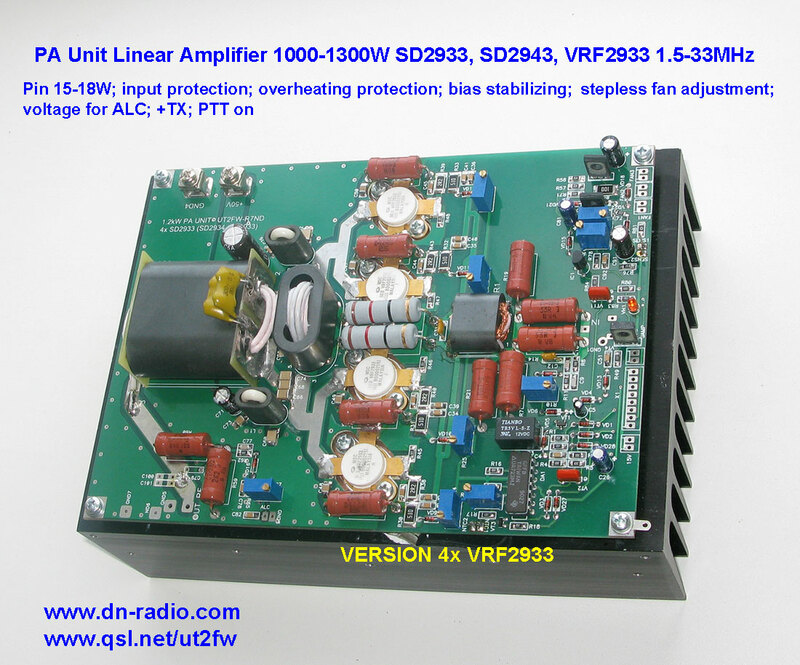 Updated version for Solid State PA Unit DN-600 ver 2015 year. 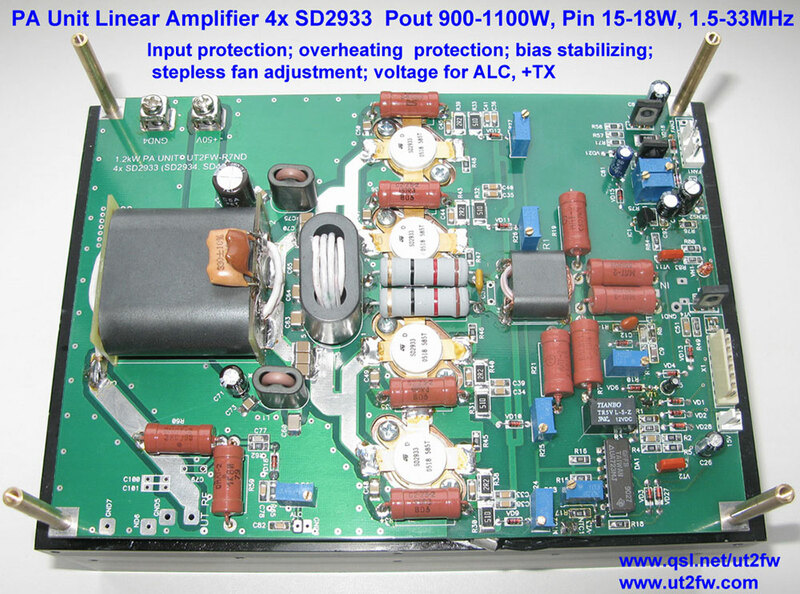 In PA Unit can be used MOSFETs: SD2933, SD2943, SD4933, VRF2933, VRF2944 . With up to 900-1400W output power. With using MRF150 or BLF177: up to 600-700W output power. Unlike previous versions PA Unit for DN-600, this version have additional stabilizing BIAS integrated, increased transformers size. Changed diagram and PCB topology. 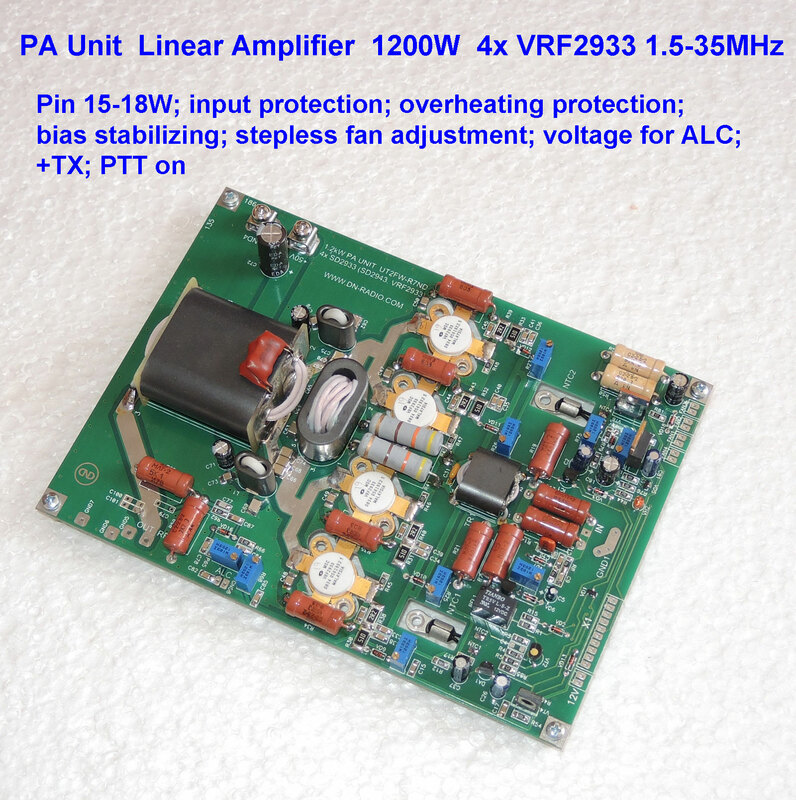 With those changes, possible to obtain up to 1400W on all bands 1,5-35MHz.